Okay, readers! Here is part two of the crash course in X-Men lore for you! Now please remember, I do not know EVERYTHING there is to know about the X-Men. There are many others out there who are more qualified to tell you about them than I am. I hope that some of them are reading this post right now. All the same, I have started this and I intend to finish it. Plus, if you would like to see some of the X-Men I have just told you about, I can recommend about two or three X-Men TV series which will give you a glimpse of the characters I have been talking about. 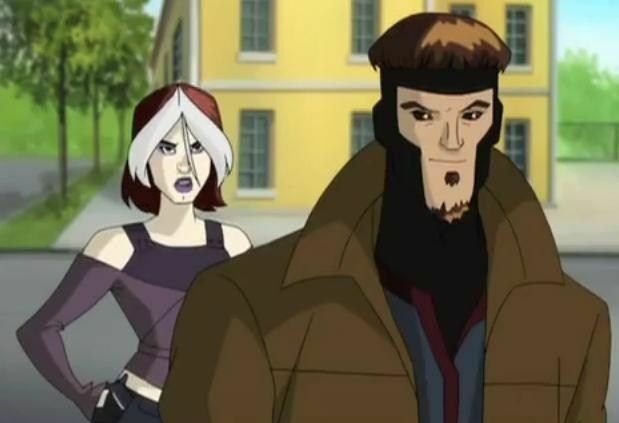 These are the 1990s X-Men series, the X-Men: Evolution TV series, and the series titled Wolverine and the X-Men. Of these three, the 1990s series is the most faithful to the comics (specifically, the comics written and produced during the 1990s). Evolution plays around with the characters more, making almost all the members of the X-Men and their primary antagonists teenagers. Though this series is not as faithful to the comics, it is not bad. Wolverine and the X-Men follows the more recent changes made to the X-Men comics. This series only lasted one season, and while it is not bad, it does follow the comic book writers as they take liberties with the established characters and storylines. Aside from a few episodes and characterizations, it kind of made me grit my teeth on a lot of anger and disappointment. Now, with these series named for you to peruse as you wish, we will continue with the next phase of our discussion of the X-Men. Who are the X-Men’s enemies? 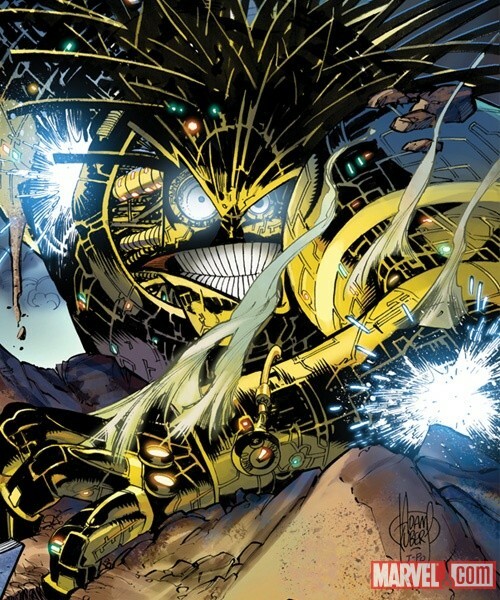 The X-Men’s enemies are, like the Avengers’, myriad. As I said in my last post, mutants are generally viewed with fear and hatred by normal humans. Part of this is justified: if someone is telepathic, how can you keep them from reading your mind and learning all of your – or someone else’s – secrets? Someone born with super speed would be an unstoppable thief. And someone who could gain control of other people just by touching them – that opens up an ugly can of worms right there! The other part, of course, is less well-founded. After all, whether the Marvel writers scientifically name mutants Homo superior or not, it is kind of hard to believe that mutants will eventually replace regular humans. It has not happened yet, mostly because the writers cannot let it happen. If mutants replace humans, then half of the X-Men’s story potential goes up in smoke. Not to mention heroes like Tony Stark, Hawkeye, and the Punisher have to be replaced by people with powers. Yeah. That would go over splendidly. NOT!!! Besides, mutants are humans. They were just born with different abilities regular humans cannot access. At least, that is what I like to think. On the other side of the argument are mutants who do not feel they should limit their power. If they are so much more advanced than others – mutants and humans –why should they not lead? Why can’t they use their telepathy to get what they want? Why shouldn’t they make other people their puppets? Erik Lensherr/Magneto: Erik Lensherr is actually a false name. I cannot recall his real name right now, so for the moment we are going to call him by his villain codename: Magneto. Commonly called “the Master of Magnetism,” Magneto’s mutant power is over anything and everything that has even the slightest bit of metal in it. He is one of the X-Men’s most dangerous foes, but he is also one of their most tragic antagonists. During World War II, Magneto and his parents, along with other Jews, were rounded up by the Nazis. Magneto’s family was taken to the most brutal of the Nazi death camps: Auschwitz. Stories vary on how he got out: some have Captain America and Wolverine rescuing him, others have him getting out after the war, others tell different tales entirely. (I myself like to think Cap and Wolverine rescued him.) No matter how he escaped, Magneto’s parents did not survive the concentration camp. Exposed to evil, and at such a tender age, Magneto never forgot it. He tried to make a life for himself, married, and even had a daughter. But some calamity of a sort hit the place where they were living. The townspeople went wild, and Magneto’s first daughter was killed in the panicking mob as they ran helter-skelter through the town. That was when he first unleashed his magnetic powers for the world to see. Previously, he had kept them hidden. He ended up killing a whole lot of people in an attempt to rescue his daughter. His wife, horrified by this display of a power she never knew he had, fled. Magneto later searched for her but could not find her, and eventually he gave up on ever recovering her. Sometime after this, he met Professor X, when the other was still able to walk. The two became friends and tried to help heal the world. They learned about each other’s mutant powers and helped each other keep their secrets. 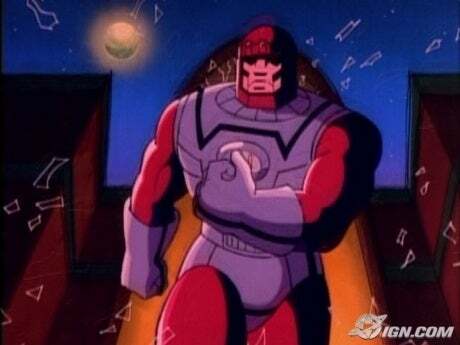 But with increasing pressure being put on mutants everywhere, Magneto came to feel actions, not words, were needed. While Professor X went about trying to talk everyone into calm, rational discussion, Magneto started imposing his will on everyone. Professor X ended up standing in his way, and the two stopped being friends and became the most bitter of enemies. Brilliant as Dr. Doom and one of the most cunning men in the Marvel Universe, Magneto has a personality as magnetic as his powers. He draws mutants – good and bad – to him like paper clips. The good ones, once they realize what he is really like, get the heck out of Dodge, or they are corrupted to see things from Magneto’s perspective. The bad ones stay with him, either because he is their ticket to free destruction or, in some cases, because they are absolutely terrified of him. Magneto has had several teams of not-so-nice mutants to back him up over the years. The Brotherhood of Evil Mutants was probably his best and most dangerous team; his Acolytes had more members, were dangerous, but he could not control them as closely as he could the Brotherhood (I think). All in all, Magneto is the enemy the X-Men face off against the most, in any series. Sometimes he reforms and becomes a fairly nice guy, but that almost never lasts. For the most part, he is always fighting the X-Men. He is a tragic figure, I know. But that hardly makes him a less dangerous opponent! Quicksilver and the Scarlet Witch: That is correct. Avengers Quicksilver/Pietro Maximoff and Scarlet Witch/Wanda Maximoff served for a time in Magneto’s original Brotherhood of Evil Mutants. The two are, in fact, mutants. But because Disney owns Marvel Studios and the Avengers while Fox Studios owns the X-Men, in the Avengers films Quicksilver and Scarlet Witch cannot be called mutants. Disney does not own the rights to “mutants” as they relate to Marvel Comics; Fox does, and they ain’t selling them back to Marvel and Disney any time soon. Hence the reason the twins are not referred to as “mutants” at any point in Avengers: Age of Ultron. For those of you who might be a little confused as to why Quicksilver and Scarlet Witch would work for Magneto, there are two reasons for this, though the twins only knew of one at the time. First, Magneto saved Pietro and his sister after Wanda accidentally set a barn on fire with her powers and, in running back to Pietro, led an angry mob of villagers to their campsite. Magneto defeated the mob, saving the twins. Owing him their lives, the two had to repay him somehow. So when Magneto took them in, trained them in the use of their powers, gave them codenames, and had them fight the X-Men, they were honor bound to do whatever he ordered them to do. Though they recognized that the X-Men’s cause was just, they owed Magneto their lives. It was a debt they had to repay, and the way he wanted it repaid was by their service to him in the Brotherhood. The other reason the twins were part of the Brotherhood was to foreshadow poetic irony. Magneto never realized, until several years later, that the twins he had rescued from angry villagers in the middle of Eastern Europe were his twins. When his wife ran off after he demonstrated his powers publicly for the first time, she was pregnant. It was the middle of the winter when she found a place to have her child. Only, when she had the baby, she realized there were two: Pietro and Wanda. Afraid that her husband would find her (and thus the twins), Magneto’s wife left her children with a caregiver and went out into the freezing cold. Winter caught up with her, as she had planned, and no one knows just where the snow buried her. The twins’ caregiver eventually gave them to a Gypsy couple, the Maximoffs, and so the twins grew up as Gypsies and bear the last name of Maximoff. They had been separated from their adopted parents by the time Magneto met them, and apparently he did not notice any family resemblance. Later, after Quicksilver and his wife, Crystal of the Inhumans, had a daughter, Magneto dropped in to get a look at the little girl and, in the process, told the twins that he was their long lost father. Wanda was struck dumb with shock and horror but Pietro, ever the fastest to react, snatched his daughter Luna from Magneto’s arms and told him that he would never recognize him as his father. The only father he would ever accept was the Gypsy man who raised him and his sister. The twins have had daddy issues with Magneto ever since (thank you so much, Marvel writers – ugh! ), but only in the newer X-Men TV series and comics have they willingly accepted Magneto as their father. Victor Creed/Sabertooth: Recent rewrites to Sabertooth’s history have seemingly made him Wolverine’s half-brother. He is at least as old as Wolverine, if not older. Like Logan, Victor Creed has animal senses and a healing factor. But he listens to his animal instincts more than Wolverine ever has. Vicious, brutal, and bloodthirsty, Sabertooth absolutely revels in carnage. Put simply, he loves the thrill of the kill, and where Wolverine has a sense of honor and loyalty, Sabertooth has only a desire to destroy. Sabertooth and Wolverine were both part of the Weapon X program, but only Wolverine underwent the procedure that bonded adamantium to his skeleton. Older comics do not explain the history between the two, but newer stories suggest Creed could not undergo the same operation because his healing factor does not work the way Wolverine’s does. Speaking of Wolverine, you remember when I said his memories were wiped by the Weapon X goons? Well, while he cannot recall much about his past, he does remember this: He HATES Sabertooth! The feeling is apparently mutual. Sabertooth loves to brawl with Wolverine. The fact that they both have healing factors means they are, for all intents and purposes, evenly matched. Neither of them can kill the other, but they sure as heck try! 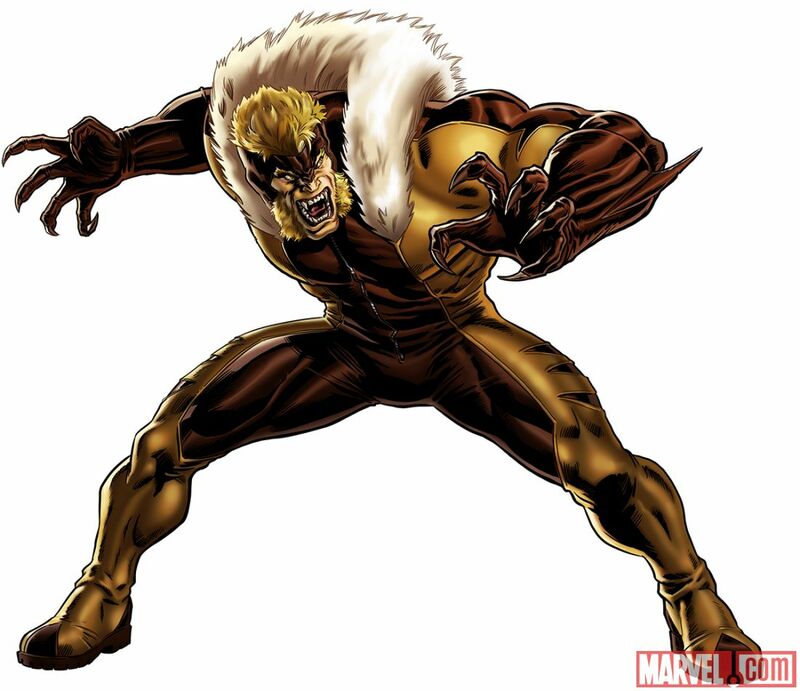 Sabertooth has worked for Magneto from time to time, as well as other enemies of the X-Men. For the most part, though, he is a free agent. He does what he wants, goes where he chooses, and every chance he gets, he leaves a body behind him. Sabertooth is an absolute animal and a holy terror in a fight. Few can stand up to him like Wolverine can, but he has been taken down by other heroes and X-Men. The thing is, like any wily predator, he always finds a way to get out of his cage and go on the hunt for his favorite prey: Wolverine or one of his friends. 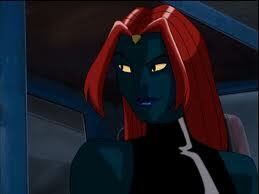 Raven Darkholme/Mystique: As I have said elsewhere, I despise Mystique. Mystique is a blue-skinned meta morph. That is, she can change her form into anyone else’s form. She can impersonate anyone, male or female, or pass through town as a crow or a cat. Though she is not his equal in power by a long shot, Mystique is easily Magneto’s equal in terms of cunning and scheming. While she has occasionally formed her own Brotherhood of Evil Mutants (often using Magneto’s goons when he is not leading them himself) and once even joined the X-Men, the only one Mystique seems truly interested in serving is herself. Sure, she talks the talk about mutants and humans not being able to live in peace, and I am pretty sure she believes most of it. But in the end, all her schemes boil down to the fact that she wants what she wants, and she wants it yesterday! As mentioned previously, Mystique is the X-Man Nightcrawler’s birth mother and the X-Man Rogue’s adopted mother. She had Nightcrawler in Germany and, when she realized her son’s mutation was obvious and that he could not hide his true features in some way, she abandoned him. She left him where he could – hopefully – be found by someone willing to take care of him despite his appearance. Mystique ran into Rogue much later. 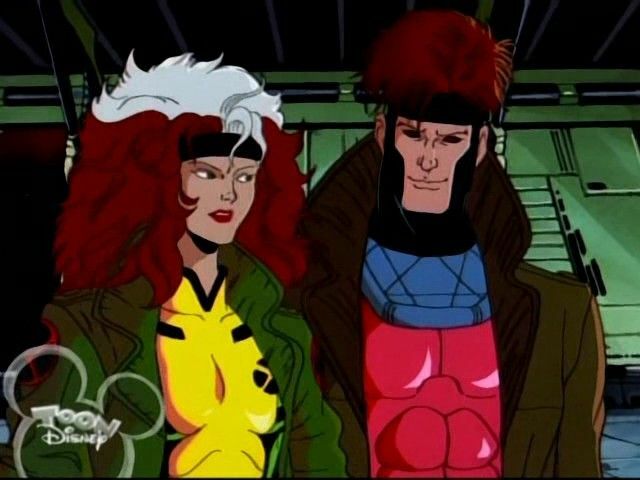 In the Evolution TV series, she says she adopted Rogue when the X-Man was four years old. 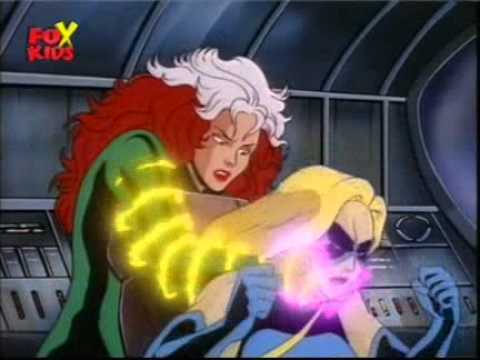 In the 1990s TV series, as in the comics, Mystique found Rogue after the girl ran away from her real family. 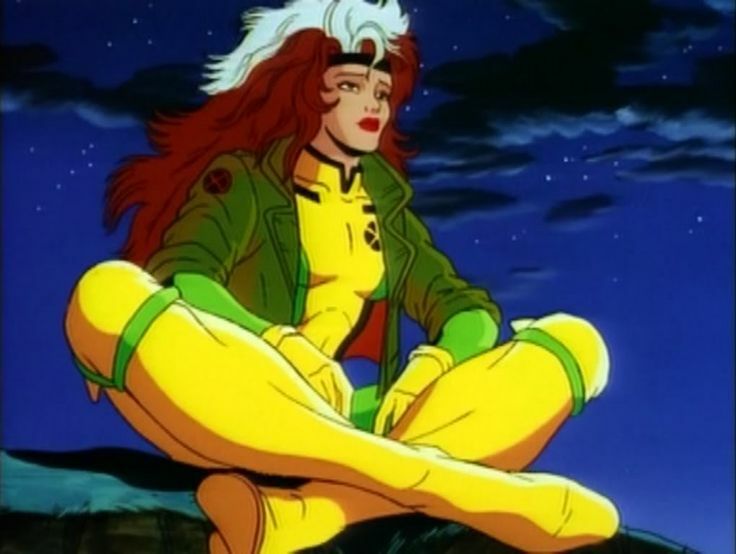 This was because Rogue’s ability to “download” other mutants’ powers into her own body means, according to the latest rewrites, that she can recall those powers and use them whenever she chooses. But it also means that she will always have a “copy” of the original mutant psyches in her mind. 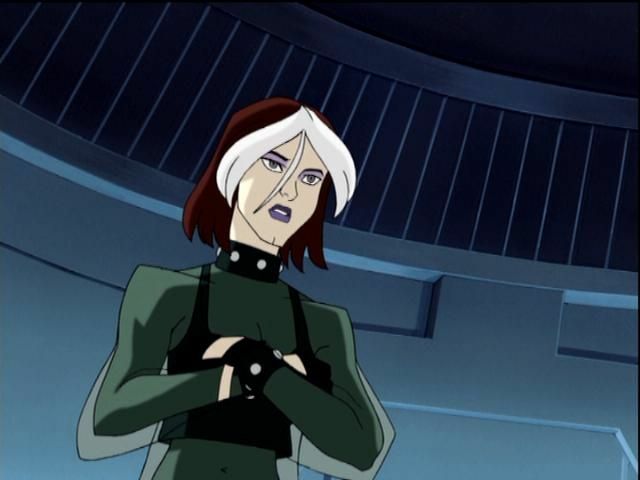 In Evolution, the fact that she had so many psyche “copies” in her head made Rogue turn on the X-Men in one episode. Only when the Professor was able to erase the “ghost files” and their powers from her mind did she regain control of herself – though she literally passed out at about the same second she was back in the driver’s seat. So Mystique really cares only about herself. She may wish that she could be a real mom to the two X-Men, but in the end, she does not have the desire to make that wish a reality. Self-serving to the last, I suppose. And yeah, this is a good part of why I HATE Mystique! Man, I wish they would have Black Widow or some other heroine beat her to a pulp!!! Cain Marco is Professor X’s half (or adopted, maybe?) brother. The two had the same mother, but different fathers. Cain somehow became convinced that his father liked Professor X better than he liked his own son (Cain). According to the 1990s series, the reason Cain’s father showed such preference for Charles was because he was milking Xavier’s sick mother for her wealth, a fact he was doing his best to hide from both boys and their mother. After the two reached adulthood, Professor X got all the admiration and attention, while Cain was left on the sidelines – again. Fed up with this treatment, Cain went out into the world to make a name for himself, only to rabbit when things got nasty. In the process, he stumbled on an old temple with a magic crystal in it. 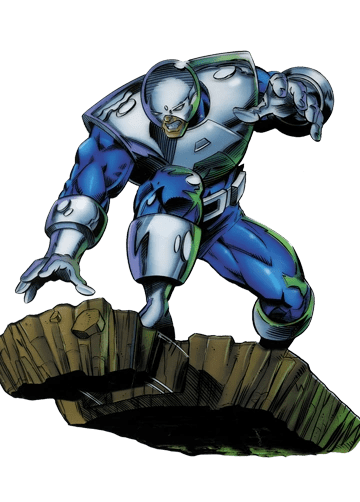 The crystal granted him the suit and power of the Juggernaut (this story idea is construed as Cain awakening his own mutant powers through mysticism in X-Men: Evolution). Ever since, Cain has sought to use his power to harm or kill Professor X. The X-Men, naturally, do not let that happen, but it is very hard to knock down Juggernaut and keep him down. In terms of sheer power, only the Hulk or Thor could match – and likely beat – Juggernaut. Even Wolverine, for all his durability, can barely hold up to Juggernaut’s strength. The X-Men’s only real course of action when faced with Juggernaut is to take his helmet off, since the helmet shields him from psychic attacks that knock him down and out. You can imagine how easy it is to get in close to take Juggernaut’s helmet off! It has taken entire episodes for the X-Men to accomplish that feat! Lacking Magneto’s finesse and Mystique’s cunning, Juggernaut is dangerous simply for his strength and his single-minded determination to kill his own brother – and anyone who stands between him and Professor X’s wheelchair. The Sentinels and Dr. Bolivar Trask: The Sentinels have to be the absolute worst and most terrifying enemy that the X-Men have ever faced. These mechanical monsters were built by Dr. Bolivar Trask, a scientist with a mutant son who wanted to control mutants. His solution boils down, essentially, to the Nazi and Communist solution. If you do not like them or want them around, then you get rid of them. But with the varying powers each mutant possesses, normal humans risk a great deal in getting close to a mutant. Even if the mutant simply ties up and abandons his pursuers where they can be easily found or rescued, the end result is that the mutant escapes. Not only that, but humans have compassion, or minds that can be controlled. They can be convinced not to harm someone. Machines have no such obstacles to their mission parameters. With government funding, Trask designed mutant hunting and capturing humanoid machines he called Sentinels. 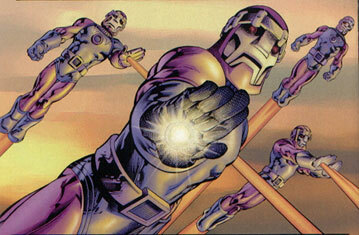 The first Sentinels were supposed to “only” capture mutants so they could be removed to high security areas where they would not be a threat to anybody. But it is barely a step from capturing and holding mutants to capturing and exterminating those who are different, or who simply do not match up with the machines’ “ideals” of perfection. While in the present the X-Men have to deal with the “capture and round up” Sentinels, future teams of X-Men often live in a blasted world where barely any mutants or humans have survived the rise of the Sentinels. In these dark futures, mankind and mutantkind have both been driven to near extinction. After all, mutants come from humans, don’t they? To permanently erase mutants from the world, you would have to get rid of a lot of humans who could someday become mom and dad to a mutant. In these futures, no one is safe. X-Man, human, mutant, Avenger – all are hunted down and destroyed, or left to forage for survival in the ruins of nations across the planet. This makes the Sentinels by far the scariest and worst enemies of the X-Men. Like Ultron, they cannot be destroyed. Unlike Ultron, they have no emotion – they are simply machines following the twisted logic of their programmer. Mastermold: The “master” Sentinel, often their leader in the tortured futures the X-Men usually confront in their storylines. Mastermold is implacable, driven only by his programming: bring order to the world. You do that by getting rid of fear, anger, and hatred. And the only physical way of doing that, beyond a human or mutant’s own self-restraint and control, is to eradicate humanity from the face of the Earth. This guy (gal in Wolverine and the X-Men – blech!) is as bad as any Nazi or Communist. As long as he survives and does his job, who cares how many he kills and buries? The Morlocks: The Morlocks are mutants who live in the sewers underneath New York City. Most of them are criminals, by choice or by the fact that their mutations make them stand out in a crowd and they therefore have no other way to survive. A lot of Morlocks have mutations which make them look like monsters. Fleeing persecution, they set up shop in the sewers. In the original stories, the Morlocks are a lot like a street gang. They look out for each other and take care of each other, and they will accept new members from time to time – especially if those new mutants are “too ugly” to live on the surface, just as the rest of them. The first stories had the X-Men pitted against the Morlocks fairly often. The Morlock leader, Callisto, was not particularly ugly, but she was nasty as heck. She and Storm had a running feud, due in part to the fact that Storm once led the Morlocks, but then left for the surface to join the X-Men. The Morlocks don’t like it when one of their members goes up to the surface and stays there. It reminds them that most of them are too disfigured by their mutations to return to the surface world, and thus fans the flames of their hatred for normal humans and the mutants who appear normal. In Evolution, the Morlocks are cast in a better light. They are just a group of mutants who cannot pass through the surface world without standing out like a sore thumb. So they live in the sewers on whatever they can find/steal. Storm’s nephew (made up specifically for Evolution, Storm never had any siblings in the original stories) eventually joined the Morlocks when his mutant power became obvious and made him look like a human Stegosaurus. These Morlocks were on better terms with the X-Men, but in the comics and 1990s TV show, they do qualify as enemies. Sympathetic enemies, in a way, but enemies all the same. Friends of Humanity Society: These guys are based almost entirely on the Klu Klux Klan. The Friends of Humanity Society is a feature of the 1990s TV series. They do their best to make mutants (especially the X-Men) look like monsters so that they can get arbitrary laws passed to, essentially, get rid of mutants. Later series do not really mention the Society and, by Wolverine and the X-Men, these guys are all but extinct as a group. They are replaced by government goons instead. Extraterrestrial Threats: The extraterrestrial threats are myriad. They include: the Brood, insectoid aliens who transform members of other species into themselves via parasites; the Shi’ar, humanoid aliens generally friendly to Earth and the X-Men, but they have their bad apples; the Phalanx, mechanical aliens who eat anything organic; and a few other guys I can no longer recall. Perhaps I should have listed the X-Men’s occult enemies instead. They have faced a lot of magic-powered bad guys in their day! Apocalypse: I have no real idea what is going on with Apocalypse these days. Initially, as I understand it, he had been going through time setting off wars to eliminate the weak so that the strong would remain. (He is/was more of a genetic purist than even the Friends of Humanity bunch!) In the 1990s comics and TV series, he is the one who gave Angel his new wings and “programmed” him with the “dark side” he still struggles to control. (Yes, Archangel absolutely hates Apocalypse.) 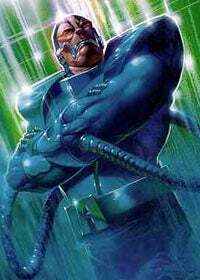 Nowadays, though, Apocalypse is portrayed as a mutant from Ancient Egypt who survived to return in the here and now. He is “burdened” with the same “glorious” motivation as Magneto – only writ much, much larger and more deadly! Mr. Sinister: A creepy, pasty faced guy with very sharp teeth who strongly reminds me of a vampire and who dabbles in experiments that would give Dr. Frankenstein nightmares. I am sorry to leave you with that brief a description, readers, but if I say anymore about him, I may throw up on my keyboard. Well, readers, these are the top twelve bad guys (more or less) whom the X-Men have to deal with. I covered all of the interesting bad guys above; they may not compare with the baddies the Avengers have to face, but they are pretty darn dangerous all the same. As a side note, Magneto has gone head to head with the Avengers a few times. What can I say? The guy is versatile…and his children are Avengers. It had to happen! 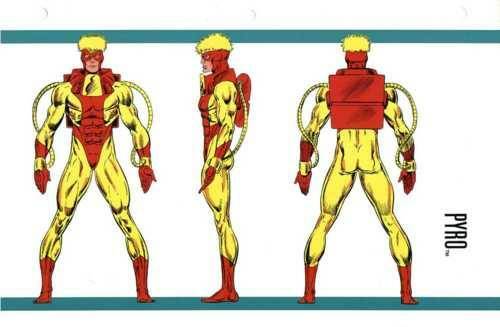 This entry was posted in Marvel Comics' Characters and Stories, Spotlight! and tagged 1990s X-Men TV series, Apocalypse, arch-nemesis, Avalanche, Blob, Dr. Bolivar trask, Dr. Doom, enemies, Friends of Humanity Society, Juggernaut/Cain Marko, Magneto, Mastermind, Mastermold, Mr. Sinister, Mystique/Raven Darkholme, Pyro, Quicksilver/Pietro Maximoff, Sabertooth/Victor Creed, Scarlet Witch/Wanda Maximoff, Sentinels, Shi'ar, the Brood, The Brotherhood of Evil Mutants, the Morlocks, the Phalanx, Toad, Wolverine and the X-Men, X-Men, X-Men: Evolution on September 9, 2015 by The Mithril Guardian.